Once in a while, Right in the middle of an ordinary life, Love gives us a fairy tale... And one would love to carry one's fairy tale .. in a storybook which everyone would like to read over and over again.. Wedding-the most auspicious occasion, bringing closer two souls.. two very happy souls.. And VIVAAH would love to frame the happiest moments for all the lovely couples around.. VIVAAH, a group of highly spirited and talented photographers, have been travelling to and fro, to capture different types of Weddings. VIVAAH has crossed several milestones, made friends and eventually became a huge family. We invite everyone to come and see us, and VIVAAH promises to hold all your precious memories. Vivaah is a professional photography services company, specializing in Kids Portraits, Wedding, Bengali Wedding, Bridal Portraits, Candid Wedding, Catholic Wedding, Christian Wedding, Concept wedding, Couple Portraits, Engagement, Hindu Wedding, Indian Wedding, Marwadi Wedding, Muslim Wedding, North Indian Wedding, Reception and Theme Wedding photography. We offer products and services such as Poster. We accept customized photography requirements. Our studio is in Kolkata. We cover events in West Bengal and All Over India. We are comfortable communicating in Hindi, English and Bengali. The team,Vivaah is excellent. We never expected to meet such a team someday. They are very punctual, very professional. The Photographs of my wedding came so well. I got my final preview of the album . Also i got a video trailer which is amazing. Thanks Vivaah. Had a really memorable experience with VIVAAH. Very Kind & Understanding Photographers. They were really passionate & determined about their job. In Love With Their Work. Will definitely recommend them without any doubt?? Thank you for being our wedding photographer. You made us feel at ease and showed endless patience, we absolutely loved having you there to share our day with us. We thoroughly enjoyed it and hope you had a good time as well"
The service, creativity, quality is too good. They are very expertise. People should book their services. They gave us a beautiful album. We never expected to get the album and video within 1 month. But they really did. We hired them for my sister's wedding. They are excellent. We needed the videography within 5 days. As promised they gave the edited video within 5 days. Also we are getting the album in next month. They are very much polite. The team members are so creative. We will hire them again for our next events. I am very much satisfied with the output of their work as photos tells the story which even million words can’t express. And most importantly Each and every member from Vivaah are very friendly and polite to their clients and listens to clients requirements very carefully and works accordingly. I will be hiring them again for other events too. Professional and very punctual photographers.They arrived at the event on time and quality of pictures are very good.Only improvement required in the concept of creativity.Videography needs improvement also. 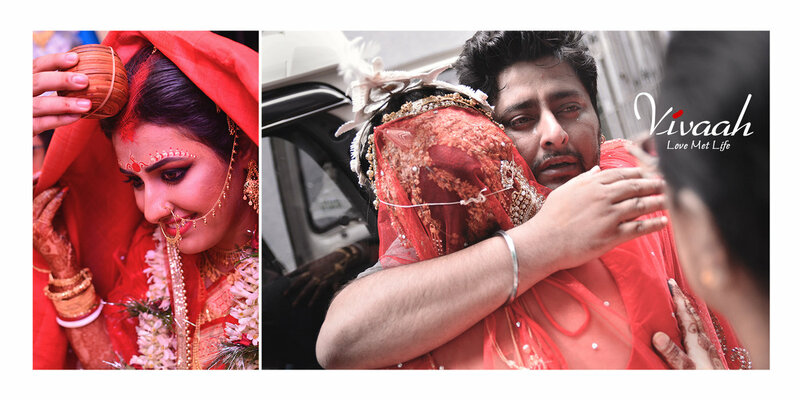 Team VIVAAH is very dedicated and committed towards there work, my entire wedding photography was done by them and we both really liked their work. One of the best photography team in the City, worth the money. Vivaah is the best wedding photography team in town made with a bunch of extremely dedicated, enthusiastic and passionate photographers. The thing which we liked most about Vivaah is that they always make every frame very traditional , natural and unique with their special magic which you can't even think about. We always wanted our wedding and pre-wedding pictures to be us-like, to be full of memories to cherish in our entire life, NOT the "cinematic" ones where everything will look very artificial. And that is the reason, we couldn't think of anyone except VIVAAH for our special day. The team is very much professional towards their work commitment but at the same time they will become your very own people who will tolerate your never-ending demands without getting irritated, will continuously guide you with so much patience to make every frame perfect. We absolutely loved their work and each one in the team for their support throughout the events. We can't thank VIVAAH enough for capturing memories to cherish, for creating perfect frames for us beyond our imagination. Much love to the team. A creative young and vibrant group of people coming together to create magic on your special day and capturing moments like you never could imagine.. Team vivaah is extremely dedicated and passionate about their work and is an example of how your love towards something can bring out the best in you... my entire wedding package was done by them and it was the best decision i took?? I am happy with their service and awesome photography of my cousins wedding ceremony. lots of love and thanks to team vivaah. we got all photographs and album at time. Vivaah is really good . They are creative! You will love their ohotography. They are good and responsible. They were my wedding photographer. And i loved their work. WE ARE VERY HAPPY WITH WORKING VIVAAH. THEY DID MY SISTERS WEDDING CEREMONY..AND WE APPRECIATE THEIR WORK.THEY CAME AND WIN ALL OF OUR HEARTS.NOW WE AND ALL VIVAAH TEAM MEMBER BECAME A FAMILY. Really they are fantastic team...nice behavior and friendly.excellent photography and videography skill.Amazing experience with them..thnx vivaah.Best of luck. What I love about Vivaah is each frame they create is so earthy, lively, original and natural. I always wanted my wedding pics to be me-like, us-like. Not any filmstars's-like. And there Vivaah wins. The team is professional in terms of work commitment but very own in terms of "being there for you". I absolutely love the team for their work as well as for being who each of them is. Thank you "Vivaah" for making my memories, frames more perfect than my imagination. Much love. The photographers are very professional..
Had taken their services for my marriage and reception. I didn't have to think twice before booking them for my sister-in-laws wedding. The quality of their pictures were excellent. Just want to say a massive thank you to the whole entire team of "Vivaah". Sayan da, Dipen da, Tikai da you guys have honestly done an amazing job and I can't thank you Partha da and your team enough for making Tanurima and Indranil da's dreams come true. Everything you did was spot on and to what we wanted ?? Good photography by professionals..creativity was good.. Value for money service.. Would love to recommend others as well as looking forward to see more Of their works in future and want to wish them a very best of luck for their future work. We have been working with them for all our family occasions. Weddings to rice ceremonies. They are absolute professionals and capture real good moments. We are indebted to them for all the Beautiful memories. All our friends and family swear by them. Recommended highly. The most important thing is that they capture moments which are most precious and are candid. Also one thing needs special mention. In our case, the time of bodhuboron was not communicated to them. But they managed well at the last moment and got photographers team available at the right moment. Your message was successfully sent to VIVAAH. The Photographer may contact you soon.